SAW032175 SCOTLAND (1950). British Dyewood Co. Ltd. Carntyne Dyewood Mills, Shettleston Road and Tollcross Park, Glasgow. An oblique aerial photograph taken facing south. This image has been produced from a crop marked negative. Title [SAW032175] British Dyewood Co. Ltd. Carntyne Dyewood Mills, Shettleston Road and Tollcross Park, Glasgow. An oblique aerial photograph taken facing south. This image has been produced from a crop marked negative. St. Michael’s Carntyne Free Church, demolished 1965. Park gates on Tollcross Road. Vale of Clyde Jnrs. home ground. Nicknamed Tin Pail, the club was formed in 1873 and is based at Fullarton Park. Roundabout here seems to be Parkhead Jnrs. original ground. 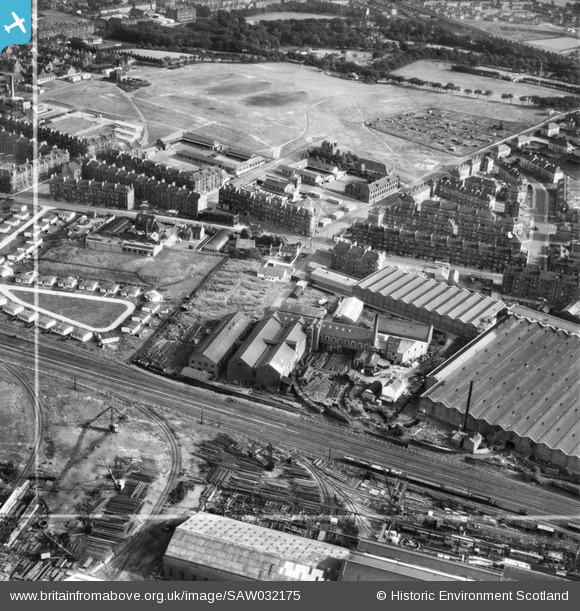 J.C.Watt's - Avondale Works, Old Shettleston Road - about 1930. The Forge Bar : Interior, 1964. Tollcross Park museum, later a nursing home.